The Crane Advisor ...makes finding the right overhead crane easier. 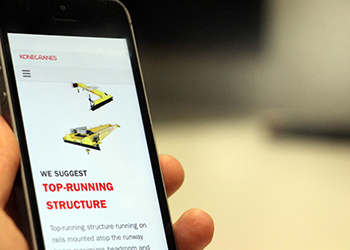 Konecranes has launched an online tool that allows customers in the region to get customised recommendations on the best crane for their job. The Crane Advisor makes finding the right overhead crane easier. The tool is already being used in North America and is now made available in the Middle East, with new features and content, according to an official for the company. Customers have to go though four steps to get a crane recommendation – industry, capacity, span and duty class. After submitting the answers, the user immediately gets a personalised overhead crane recommendation. “With this recommendation, the customer can familiarise himself with the product offering even before continuing discussions with a Konecranes sales representative. This approach saves the customer’s time and decision making. In a world where time is money, this is very valuable,” says Myyrylainen. The icon-based-design of the tool makes it extremely user-friendly. The product offering on the Crane Advisor is available globally, and if there are some specific customer needs, Konecranes’ local sales representatives can help to find the ideal solution. Konecranes has a team of crane experts, locally available in the Middle East. With regional offices in the UAE (Dubai and Abu Dhabi) and Saudi Arabia (Jubail, Jeddah, Riyadh and Yanbu), the company provides extensive coverage and after sales support throughout the Middle East. Konecranes is a world-leading group in the lifting business, serving a broad range of customers, including manufacturing and process industries, shipyards, ports and terminals. In 2016, group sales totalled €3.278 billion ($3.86 billion). It employs 17,000 employees at 600 locations in 50 countries. 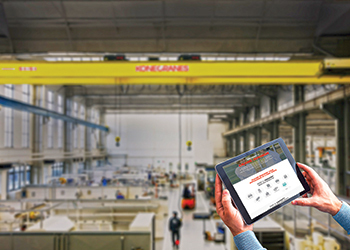 As a leader in the overhead crane industry, Konecranes invests in R&D to bring new technologies to the market.